Fr. James Schall is a member of the “old school.” He teaches at a very old school, but he is somewhat of an anomaly. He is an incredibly educated man who resists the fads that drive much of the university corporation machine today. He thinks that education has something to do with virtue, that college is about more than a career, and that being interesting is of upmost importance for a professor. He has been hailed by some Catholics as one of the ten greatest American Catholic intellectuals of all time. He has written more than 30 books and 350 essays. I have never read anything by him that I did not immediately recommend to others. I once read in one of his essays that libraries are important places for discovery. When one searches for a book, one is led to shelves upon shelves of related texts, and this enables a kind of “intellectual exploration.” I was wondering around the twelfth floor of Notre Dame’s Hesburgh Library, searching for books on Christian philosophy, when I came across Fr. 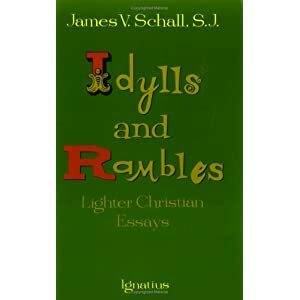 Schall’s book of “Lighter Christian Essays,” titled “Idylls and Rambles” (if you’re trying to find it there, the reference number is BT 1102 .S335 1994, although it’s currently checked out…). I’ve read works by Fr. Schall on Crisis Magazine, The Catholic Thing, and a host of other websites and blogs. Much of his writing can be found on his website here. When I pointed out to her at the time that it is impolite to type personal correspondence, especially to one’s own mother, she merely and dryly responded that the purpose of letters is to be read. And, she continued, it is impolite to expect one to read what one cannot be made out. Such clear logic is probably one of the reasons mothers were invented in the first place, I suspect. Sacred music, most proper to churches, should never be applauded, in my view, preferably not even in formal concerts (where, unfortunately, too often we must go to listen to it). The current tendency to applaud in churches strikes me as all wrong. There is nothing more powerful than hearing a great work of sacred music to complete silence. Sacred music in its essence is designed to lead us to what is surrounded by but beyond music itself, to what is holy and awesome as such. Women don’t have rights. They have, rather, graces, and sacrifices, and tolerances, and patiences, and commitments that make the word “rights” sound ridiculous as a term adequate to cover what it is they confront and accomplish in life. I know very few women whom life has treated “justly”. But somehow, I know even fewer women who really expect that it should, and most of these work in universities. I was thinking of this the other day after I had gone to a parish where, as far as I could tell, the celebrant (not me) made up all three collect prayers of the Mass instead of following the ones in the Missal. At least he did not make up the Canon, though I have seen a bit of this happen, too. I found myself distractedly wondering whether what the celebrant said was accurate, was according to the way the Church prays at Mass? Was what the celebrant made up conformed to any truth other than his own? We are beings who seek a truth we did not make. We want to tell others about it simply because it is and is worth saying. This illuminates our ‘I’, who we are. Anyways, this is a great little book to have for random times of the day when you want help in pursuing the higher things. You can order it here.